Would you believe we're now out of Supreme CDs too? Still lots of Loonyland and a few Kid Mystic CDs... Frankly, I look forward to getting out of the CD business if I can. I don't make any more money doing it, and I have to handle sales tax on California ones, and I have to drive down to the post office, fill out customs forms, deal with shipments that don't get where they're going... I'd like to be all downloads like most indies! Maybe I should look into Cafepress on-demand CDs. Then I don't have to mess with anything, and I could have CD versions of every game. The downside is they're sure to cost a whole lot more, and be lower quality, which is a given with print-on-demand. Okay, so the last part is not related, but it is the best part. Anyway, the more relevant portion describes something that bites me at both ends. And at other orthogonal ends. Back when I made Loonyland 2 (and to a lesser extent with earlier releases), some people were disappointed that it wasn't like the previous games, it was this big RPG thing. Of course, nowadays people lump it right in with the others, as if all our big games are exactly the same. But at the time, it seemed a horrifying departure. Then Costume Party. How could I make something without 3D graphics, and a platformer? How dare I! Then here's where the both ends come in - I started making flash platformers, beginning with Robot Wants Kitty. Not only did old-school Hamumu fans flip out that this was not what they were here for, but suddenly, there's a new group. Much less loyal, but immensely larger: fans of the Robot Wants games. These people just want more and more Robot games, no matter how beaten into the ground that concept is. So now, nobody is happy! Except me, of course. Because I just keep making whichever game I want. And luckily, there have always been, so far, people who really appreciated each new one, even if they're not the same people each time. It feels good to be making a living doing that. Sorry it's upsetting to so many people each time I make something new, but truly, I am not a robot nor a monkey, and it is for sure that I will not dance even if the beat is funky! I am a geek, after all. I work for myself so that I am free to make what I want. If I just made what people told me, it'd be the same soul-numbing grind that I'd get by working for a company. Except without the promise of a paycheck. As much as it may pain you, your songbird will not sing in captivity. It can't. You can't force it. You have to set it free, then sit in the window and listen. Appreciate the songs that come in, though they startle you with their variety and intensity, they are the songs of a free bird. Hmm, sounds like Skynyrd has the same problem? I bet they're sick of that song. 27 comments Back to top! I finished my game! I even added a song, which sounds straight out of Charlie Brown. It's pretty solid! My wife is playing right now and sounds like she is encountering some oddness with the "good/bad" noises it makes, but what are you gonna do? It's an LD game. It seems to work mostly. 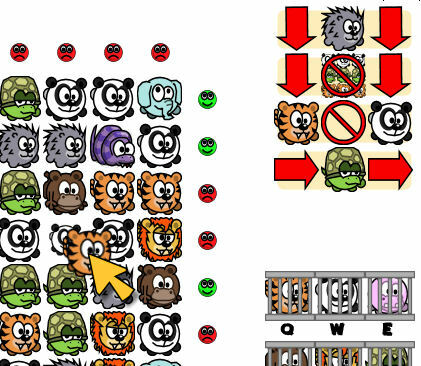 I never did implement a check to ensure levels are winnable, but I prevented it from using any of the blatantly impossible rules (like "Tiger must be next to Panda" combined with "Panda can't be next to Tiger"). I only encountered one impossible level ever, and it was because of one of those combos I prevented, so maybe it's fine. One thing I never did do was prevent it from starting in a won state... so that may happen to you! Hasn't happened to me yet. Want to try it? Click here! 10 comments Back to top! Now after having a couple of hours on it, things are going! No screenshot, but there's a title screen with 9 game modes on it, you can pick them, and they are indeed different when played. There's no timer, there's no win/lose, you can't drag & drop as is planned, rules aren't displayed in the format they will be, and the rules can't be hidden which is sort of the point of the game. But aside from those things, looking good. Nothing to say except that I'm up like 2 hours late because of heartburn or something keeping my up half the night! So there goes good zoo-making time. Now it's time for some good zoo-making! So, as Saturday draws to a close, my accomplishments are that I've made all 9 animals! I also made an attempt at a giraffe, which didn't go well at all. I'm not too excited by the snake, either. Non-round animals aren't the best for this setup. But I like the rest (well, the turtle bothers me a bit), so I think this game is looking good for being something solid tomorrow. I am fairly sure it will have some unwinnable levels (they're random, and making a solver is probably too tough for tomorrow), but you just hit retry and try again! Since the symbols you're manipulating aren't numbers now, I'm going to have to make the rules be written in a symbolic way. I could just use words, but who wants to mentally translate "Panda" into the image? Symbols will be more direct and cuter. As you can see, it currently tells you the rules. It's fairly difficult even like that... I mean, you win eventually, but it can take a while of back and forth and thinking. So I am pretty sure I'll do two modes: visible and hidden rules. I think hidden rules will be something of a nightmare, like 10 minutes and taking notes to get anywhere on it, unless it's a 3x3 with 2 rules or something. But a pretty solid logic puzzle. And it mentions animals because the numbers are going to be different animals. The theme will be a zoo, and you have to arrange the cages to make the animals happy. Right now the animals look suspiciously like numbers, though. Aha! I tossed and turned all night, reeling with the confusion of potential ideas. My wife was playing Bejeweled in bed, and I was thinking about Cluesweeper (flash game, fun, look it up), which crushed me in the monthly Kongregate contest once. Discussing with her the idea of a game that gave you clues via Bejeweled instead of Minesweeper. Thinking that wasn't gonna work. Thinking about a murder simulator (just as Jack Thompson feared! ), like it would track where a bunch of people were at a party for a series of hours, where weapons were (like Clue! ), and then you could interview the guests, and of course the murderer would lie. I couldn't figure out offhand a way for that to not be trivial and be fun. I slept. I woke up this morning back on the idea of a game of objects on a board (Bejeweled), and I have the answer! It's a game where the board is filled with runes (or animals, or some other symbols). Lights indicate rows and columns that aren't valid. It's up to you to figure out the (randomly generated) rules that determine validity. Maybe this row isn't valid because every row has to have one of every rune, or maybe it's that you can't have the same rune next to itself. Experiment! As you make changes, the rows get righter and wronger, and you start to discover the pattern. The longer you take to complete it, the more of the rules are shown to you. Solve the board faster for more points. Discover the rules! Easy to have easy/medium/hard with larger board sizes and more rules. Tricky to actually make sure the board is solvable. Will figure that out. The "discovery" phase of a trial - that's when you tell the other side what documents they have to share with you. Why that would be interesting is unknown. It COULD be interesting if they refused to provide, and so you broke into their building and snuck around stealing the documents. But that marginally fits the theme only by name. Disco, Very! Don't ask me what that is other than an out-of-sight dance party circa 1978. Science! Research to invent amazing new things. That is playable! Give it a try. That's all temp art, of course. Pandas aren't just white. The theme is Discovery... We are still watching a movie, but then I am going to think all night about what exactly that theme could mean. I kind of like "Disco, Very!" but I don't want to animate dancing.